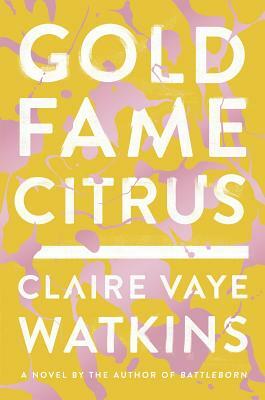 Gold Fame Citrus by Claire Vaye Watkins. In the wasteland of southern California where the desert is on the verge of taking back the earth, Luz and Ray live moment to moment in a careless existence until they discover amid the ruin and depravity a young child. Taking the child into their care, they find that their fragile love might not be enough anymore and begin making desperate plans that will lead them straight into the desert. Strange, disorienting and absolutely fascinating, Gold Fame Citrus is like a fever dream of a world where the only thing harder to find than water is the promise of a future. Claire Vaye Watkins is the author of Battleborn and a National Book Foundation “5 Under 35” fiction writer, as well as the recipient of the Story Prize, the American Academy of Arts and Letters’s Rosenthal Family Foundation Award, and a Guggenheim Fellowship, among many other honors. Her stories and essays have appeared in Granta, One Story, The Paris Review, Ploughshares, Glimmer Train, Best of the West 2011, Best of the Southwest 2013, and elsewhere. An assistant professor at the University of Michigan, Watkins has also taught at Bucknell and Princeton, and she and her husband, the writer Derek Palacio, are codirectors of the Mojave School, a creative writing workshop for teenagers in rural Nevada. "An extraordinary novel: relentlessly brilliant, utterly fearless, and often savagely funny. Watkins explores the maze of human thirst in all its forms. Here's a love story that tracks the mutating hopes of two lost souls, in prose that is fever-bright and ferociously assured, against the backdrop of the Great American Desert. More confirmation that Watkins is one of the brightest stars in our firmament." --Karen Russell, author of Swamplandia! “A gripping, audacious novel, plausibly imagined in all its remarkable details. With Claire Vaye Watkins there was never promise: it was achievement from the start, and this book repays her admirers in spades."